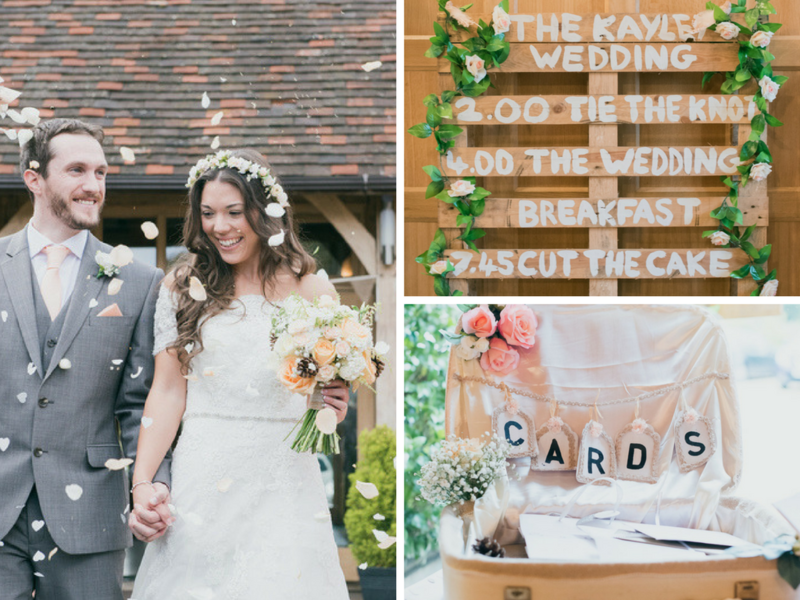 Held in Rivervale Barn in Hampshire, Natalie and Tony's wedding embraces all that is wonderfully warm and cosy about the lovely British countryside. Due to it being an autumn wedding, the couple wisely chose a venue where they could host everything in one place, from the ceremony to the reception and the guests night's stay too. It meant everyone could just rock up and have a wonderful time without a need to worry about transport - that way no one has an excuse not to be dancing well into the night! By filling the venue with homemade touches created by members of the family, hanging endless amounts of bunting everywhere and encompassing the venue in a warm glow of fairylights, the couple definitely achieved the cosiness that they were after for their special day. Natalie chose to wear a much coveted Pronovias off the shoulder white lace dress for her wedding day, and there's no doubting she looked simply stunning. She finished off the look with a dainty flower crown in peach and cream with a simple ivory veil attached. She kept her jewellery classic, with dainty pearl studs and pearl bracelet, opting for ivory lace shoes to match the wedding dress. Tony the Groom wore a grey suit to match the rest of the groomsmen and this was paired with peach ties and pocket squares to be in keeping with the wedding colour theme. Natalie and Tony decided to go for a vintage, country barn look as they felt it was the one theme that represented them best as a couple. Luckily they had some help customising the venue, with the Mother of the Groom making all the bunting for the room. This was placed everywhere throughout the barn and even in the courtyard too. The bride Natalie's grandad also made some lovely woodwork decorations from signs, crates, ladders and even created a sweetie cart. The bride's auntie decorated a vintage suitcase for all the wedding cards to be placed into, so it's fair to say it was a real family affair. The tables were lovingly curated, with the pair deciding on three different centrepieces to alternate - a birdcage with two doves, a watering can and a tea cake stand with flowers - all sat on top of tree trunk slices. With the couple meeting when they both did a charity climb of Mount Kilimanjaro, they decided to make their table names camps that they stopped off on the way to the top, as a sweet sentimental touch. Also on the tables, all the guests received favours of mini hessian bags filled with lindt chocolates along with pin badges from donations they had made to charities close to their hearts - Alzheimer's Society, Prostate Cancer and World Animal Protection. In shades of peach and ivory, Natalie opted for beautiful floral bouquets and arrangements filled with peach avalanche roses, hydrangeas, stocks, baby's breath, white lisianthus and pittosporum foliage with pinecones interspersed too. Using flowers to decorate around the venue, they had wicker hearts filled with posies of flowers, blossom trees and rose petals to decorate the aisle and fill the confetti cones. Along with this they also had two urns outside the ceremony doors filled with lots of blooms. The couple and their guests dined on an array of gorgeous foods from Galloping Gourmet. They had an alternative take on a scotch egg as their starter, a fillet of beef with a butternut squash sauce and a medley of vegetables as their main - with guests still saying the beef was the best they'd ever tasted! To finish, they all enjoyed a vanilla cheesecake decorated beautifully with gold chocolate butterflies. The canapés included risotto balls, mini shepherds pies, mushroom tartlets and mini burgers. After the guests had danced their toes off in the evening, they had a toasty BBQ cooked on the fire pit outside to help revive everyone. For the whole wedding they had a string quartet who played during the ceremony, reception and the wedding breakfast too. After that they had a live band at night, with even the Bride doing a number with them! Natalie and Tony chose a song called 'I Just Wanna Love You' from a band called the Shires as their first song, making sure to practice their first dance a few times before the wedding as they both agreed they weren't natural born dancers! Bride’s favourite moment: "Turning up to Rivervale with my Dad and seeing the venue for the first time. You spend so much time dreaming of what the venue is going to look like on the day- but seeing it for the first time – I was blown away by how beautiful it looked and how welcomed I was by Lyndsay and the staff at Rivervale. Obviously the ceremony doors opening and walking up the aisle to my future husband was my best moment of the day and the confetti shot was also lovely." Groom’s favourite moment: "Seeing my beautiful bride walk down the aisle of course. But also walking out into the courtyard to be surrounded by family and friends and to share in the happy moment. Walking around the beautiful gardens to snap our wedding photos was also a highlight of the day as it was the first time we were properly relaxed and were able to have a conversation." "To relax and to not worry about anything that could go wrong. The day will be wonderful no matter what – simply because of the loved ones you have chosen to be there to share it with you and simply because you will be marrying the love of your life. Remember, it is your day, you won’t always please everyone- just make sure you enjoy the planning and build up to it – as it goes very fast. On the day, just spend time taking it all in and enjoy every minute!" Any others you would like to mention?